With a few odds and ends still left in Belgium I hung a couple of extra days on to one of ADL’s Saturday tours, this one to Brugge, Gent and Zeebrugge. For some reason I took no photos until the Saturday - though I do recall a lot of rain on the Friday! The journey started a day early with an unusually mad dash, even by H’s standards, for 0611 Telford-Wolves, which was an on-time 158 but for some reason found it necessary to stop at Madeley Jn and Cosford. I went through to Birmingham just in case of cancellation of 0652 Wolves-Coventry. The Virgin From Hell (0706 BHM-Bomo) was late as usual so I voted for 0718 local, also late but not as late as it said on the screen. Westwood was reached at 0815, left at 1630 (pressure of work, 1615 having been agreed), just in time to miss the bus and have a very strenuous walk to Tile Hill station (arr. 1705 – needn’t have worried as the 1657 ex Cov was very late and thus the 1710 ex Tile Hill went at 1721. Further loss of time made it 15 late at Sandwell & Dudley so attempts to take up my prebooked place on the 1819 from Wolves were abandoned and I caught it at Sandwell & Dudley. On time arrival at Euston (shock) allowed a sandwich/beer/cash machine session before 2122 to Petts Wood, also on time at Petts Wood (Connex SE, even more shock). ‘twas a 466. Modestly early start in deference to my hosts who conveyed me to Petts Wood for 0725 to Waterloo. No problem with that, and plenty of time for the 0827 Eurostar. The E* left 30 seconds early, hot on the heels of 0824 to Paris which was standing at Ashford Irrational when we arrived and (I think) subsequently delayed us slightly. Tunnel transit was 20m 15s despite being slowed to walking pace at the end. A few minor delays didn’t prevent on time arrival [at Brussel Zuid] at 1210 and judicious positioning in the end vehicle got me through immigration right at the front. Much delay was caused to the booking office queue by lengthy discussion with the booking clerk who wanted to know if I had any British telephone cards. I didn’t, but had a used German one which I gave him. We also managed to deal with my ticket, an Oostende via Boom single at BFr 620. With half an hour before 1308 to Mechelen there seemed a good opportunity to allay fears (from the last time through Midi/Zuid) that Au Laboreur had closed. Rumours of its death are greatly exaggerated – it was open, very busy, and provided a Westmalle Tripel for a modest BFr 90. This was drunk in some haste, and in vain as NMBS/SNCB was in total chaos with virtually everything on the board marked late, between 5 and 50 minutes, and mostly running later still. I ended up on 1321 to Antwerpen as this was the first to appear. After much delay at Schaarbeek this was far too late at Mechelen for 1344 to Puurs so after a short period of teddy throwing the opportunity was taken to find (eventually) a bank machine. Returning to the station the buffet was rejected as too depressing, but there is a more cheerful bar in the subway where Duvel was available at BFr 70. This pleasantly whiled away a few minutes pending the 1444 to Puurs which left more or less on time despite the chaos elsewhere. At Puurs rain had set in ‘big time’ but the Antwerpen connection was waiting on P3, from which apparently there are Mechelen-St Niklaas trains as well, so physical connection to the Puurs-Boom line should be doable. The bridges (canal and – presumably – Scheldt) at Boom are between the north junction and the station. Both look in good shape though it looks as if the Scheldt one has been worked on very recently. At Boom the pub challenge was taken on. [A previous visit with JR had left us wondering if Boom was the only urban Belgian station without a pub nearby]. Leave via the bus station, walk towards town parallel to the river and the Brasserie Salpicon will oblige ( < 10 minutes). Haacht Witbier - really not to my taste, not even a bit. Nice pub, though. Note for some time: the north-east curve from Boom towards Mechelen obviously has traffic though not for a few days by the look of it. One for ADL… Slight anxiety due to the 1546 ex Boom being 8 minutes late for a 9 minute connection at Puurs but this was held. Packed to standing for one station, thereafter no problem to St Niklaas. 1627 St Nik-Gent St P was fine and arrived at 1658 just in time for the slightly late running 1655 to Oostende (the original plan to go and get insulted and ripped off in one of the Gent pubs having been abandoned, not too reluctantly). The Hotel Marion was suitably prepared and affable and put me in room 11 – a very pleasant one for single occupation and worth asking for next time. Various plans for the evening came and went, resulting in a large meal in Oostende with the intention of catching 1931 to Brugge, This may (according to Oostende departure sheet) or may not (according to Brugge departure sheet) exist, but certainly wasn’t evident at Oostende at 1930. Accordingly 1944 Welkenraedt was taken as far as Brugge for a delightful hour in De Garre (2 x Tripel and cheese), and a rather less delightful half hour at t’Brugse Beertje (draught Barbar – to be avoided as far as I'm concerned [the beer, not the pub which is superb]). Return to Oostende was via heavy rain and the 2203 from Brugge. Considerable difficulty getting up but after a shower etc., I just had time for a breakfast at the Caruso en route to the station. The ‘fresh orange juice’ was genuine, and highly commendable. The tour left on time at 0736 and headed for Brugge where it reversed, thence towards Knokke as far as Y Pelikaan and up the branch shown on the tour map to a point about 150m from the end (a loading bunker is over the line at the end). Another reversal at Y Pelikaan then along the passenger line (51B) until it was heading north. We then diverged, immediately after the end of the long left hand curve, on to a long branch still heading north and parallel to the passenger line. The freight line continues north when the Knokke line turns east, and terminates just south of the tram route. The train got to about 100m from the buffers, there being a wagon blocking the points at the end of the loop. On return from the east side lines we reversed in Brugge Zeehaven yard after waiting for a south bound freight. 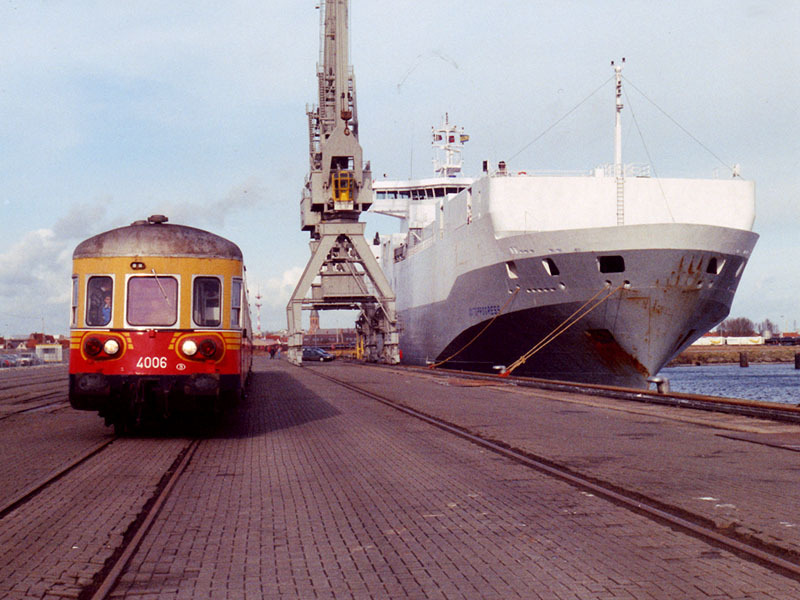 The first west side line was the one running almost due north up the west side of the docks, alongside the sea wall. This runs almost to the end of the breakwater, and end of line was reached to within a few metres. The next branch was on a new alignment parallel to the original passenger line, to Zeestation. This appears to be the one shown on Michelin 213. We then went back to the passenger line, reversed and returned to the east side of the ferry terminal (the one shown on the tour map as going almost due north). This is the Ocean Container Terminal. Returning to Brugge we continued via line 50A/58 to Gent St P and then on to Wondelgem and Evergem Sluis. The purpose of the line wasn’t obvious as it ended in plain track – presumably I was looking out of the wrong side at the critical moment! After a run to Zelzate the tour returned to Evergem Overdam on the north side of the canal, from which you can see that there is traffic to several ship/barge repair yards on the Evergem Sluis side. On the Overdam side there is scrap and chemical traffic. Efforts were made to regain time from Zelzate onwards, resulting in arrival at Moerbeke 30 minutes early in just about technical daylight. Buffer stops were reached here and at both Evergems. It appears that the line ends just south of the station. The sugar factory line diverges just before the run round loop. Return to Oostende was uneventful and the ‘rare’ route into Brugge was avoided. The temptation to get off at Brugge was also avoided and Oostende was reached at about 2030, to be followed by an early night. A suitably long sleep was followed by an equally suitable breakfast, giving time for the 0935 tram to De Panne. 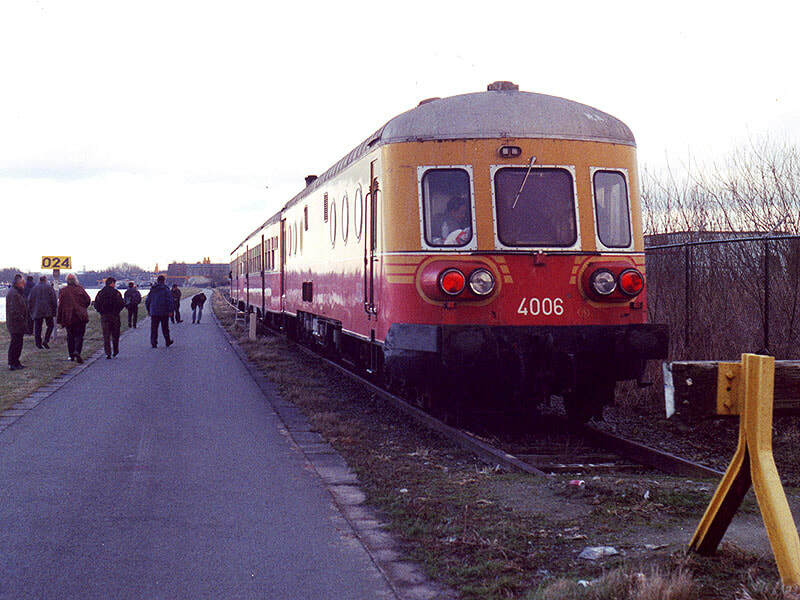 This ran late all the way, mostly due to various single line sections and specifically due to a long wait at Middelkerke for an eastbound working. Arrival at Adinkerke was about 10 minutes late but fortunately NMBS held their train to Brussel. At Brussel a city centre tour was taken in the company of a certain teacher of music, and was followed a very mad dash to Brussel Zuid (all time estimates having been based on Centraal, which I belatedly recalled is not the E* terminus!) 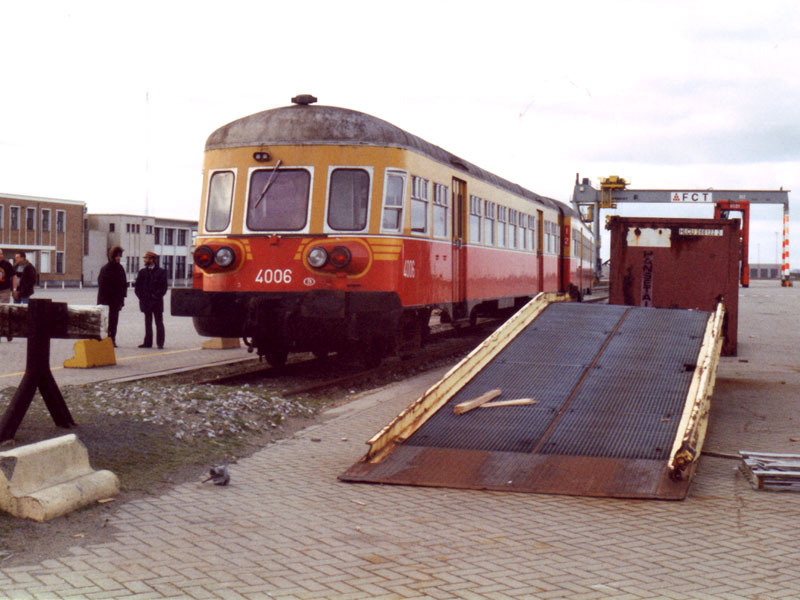 in order to arrive 10 minutes before the departure of the 1700 to London. No problem with this, fortunately, and the only disturbance en route was caused by a foul mouthed young British (inevitably) woman who joined at Lille. Back in England everything went pear shaped as usual. 19 minutes late arriving at Waterloo (via Swanley), then my UndergrounD ticket refused to work the barrier. ‘Seek Assistance’ it said – not much good when the (unattended) ‘Assistance’ box was some way beyond the barrier. Eventually I gained access via a person on the Northern Line barriers who didn’t bother inspecting my ticket. Exactly the same thing happened at Paddington. Just remind me – why did I pay the fare? Legal is best, I guess. After narrowly avoiding being run over by a Frenchman on a zebra crossing, I gained the sanctuary of the Archery Tavern for a quick Tanglefoot. Eventual return to Telford on the 2015 ex Euston was uneventful.